Do you say Kebab or Kabob? We Persians say Kabob, where the first vowel, the letter “a” is pronounced /æ/ and the second vowel, the letter “o” is pronounced /α/. You say WHAT??? Oh that’s what I said the first time I was introduced to this stuff. If you were a linguist you would spell kabob as such /kæbαb/. Isn’t that cool? No? Bummer, it was fun -at times! The truth is that I got beat over the head with this lovely linguistics stuff in grad school left and right. So here I am today putting to work what I learned!! Anyway. Ever wonder why Persian Chicken Kabob is deliciously flavorful? Or where it gets its golden color? Well my friends today is your lucky day because I have answers to such questions. And what do you know, 4th of July is right around the corner and here is yet another option to throw on the grill. First things first. The most important element in making Persian Chicken Kabob is the marinade. I personally like to marinade mine overnight. There are a couple of different ways to marinade chicken. Today’s recipe will feature a nice and easy way using one of my favorite products. I love, love, love Sadaf’s Chicken Kabob Seasoning. This seasoning comes especially handy when you are BBQing for a group, because all you have to do is just empty the bag instead of measuring your spices. You can either use this seasoning on its own or mix it with yogurt. I personally like the addition of yogurt. It tastes much better and adds moisture to your chicken. So, lets get this marinading business started! You can either slice or grate the onion. I personally like to slice half and the other half I cut into three parts. I love grilling red tomatoes, they taste so good. Place yogurt in a large mixing bowl. Empty the content of the seasoning bag on top. Mix well to incorporate yogurt and seasoning. Place onion and chicken in the bowl. 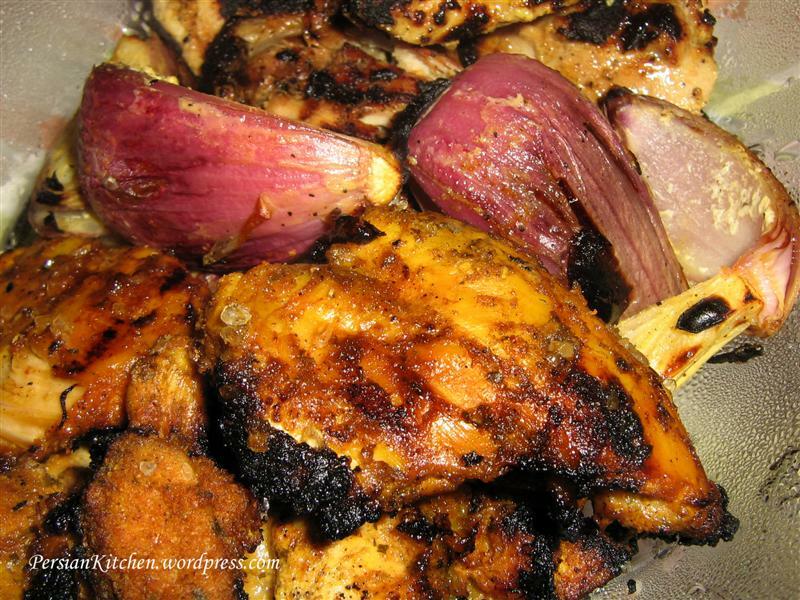 Mix well until onion and chicken are both well covered with the marinade. Place everything in a ziplog bag. Place in the fridge overnight turning over a couple of times. Tomorrow I will post Part 2 of Jujeh Kabob where I show you how to cook it. Stay tuned! hey ^^ i was wondering do u have any other suggestion beside the Sadaf Chicken Seasoning ?? Jasmine, the most simplistic way to marinade kabob is by combining yogurt, saffron, and lemon juice. Could you tell me what kind of yogurt you’re using? Is it just natural yogurt? Full fat? etc? I use plain yogurt. But you can also use low fat yogurt. Shemeal, you can either purchase them from Middle Eastern stores or from Sadaf’s online store. can you use anything else besides yogurt that will make it just as good? Megan, you can omit the yogurt and instead add a bit of olive oil to it. The taste will be different but still really good! I have some of the Sadaf’s beef seasoning, but don’t know what to serve as sides. What do you serve with your chicken? Morgan, I usually either serve Persian rice or salad. Is it possible to use white meat? What and how do I tell the butcher to cut it? I shop at a Persian market, where they have fresh meat behind the counter. Erica, yes, you can use white meat. I would just ask the butcher to cut the meat into Kabob size pieces. I am BBQing tri-tips for Superbowl and am trying to use a modified barg kabab recipe. Have you ever marinated a large cut of meat instead of cutting it up? I was going to use yogurt, onions, garlic, lime juice, salt/pepper and saffron. Any suggestions? I’m terrified I’m going to mess it up and my guests won’t have anything to eat except for chips and veggies! I had another idea. Would it be possible to marinate tri-tip similar to how you marinated this chicken but using Sadaf shish kabab seasoning and yogurt??? Marisa, No I have never marinated a piece of tri-tip. However, I don’t think you can go wrong with yogurt and the rest of the ingredients that you have listed. Yogurt actually helps tenderize the meat and add moisture. I think you have a good combo there as far as the fresh ingredients. You could use the shish kabob seasoning as well…. Do you have a recipe for ground chicken or ground beef kabob? Thanks. M Mobarak, not currently, but they are both on my list of things to make and post. I bought the ingredients to try to make this but the store only sold the chicken seasoning in a plastic jar, and your picture shows a bag, how much measurement of seasoning is in the bag ? thanks, also I would also be interested in a ground chicken kabob recipe. Ashley, I believe that it there is 2oz of seasoning in each packet and the recommended amount of chicken is 1.5lb. I’m a beginner looking to make this grilled chicken, but I don’t think we have Sadaf here, what sort of things would you recommend that I get from my local grocery store to recreate something like Sadaf. Also, are there any other sorts of spices or herbs you would add to this? I love the cornish game hen chicken kabob at a Persian restaurant…it tastes very lemony and salty…skinless, boneless game hen pieces on a skewer…the best chicken I ever had. Is this the same recipe? I don’t think it was with yogurt. Iris, usually Persian kabob is marinated in yogurt. Sometimes it is simply marinated in lemon juice. I’ve never used yogurt when making ju jeh.. i just add 6 freshly squeezed lemons, adobo, saffron, pepper, onions… most ingredients say to use only 1 cup of fresh lemon juice but i like to put more and leave it all overnight and its really really juicy. what type of yogurt can i use? Keri, any type you want. Please make sure you rinse and use clean paper towel to remove excess moisture. I also add half of a teaspoon of cayenne pepper to my marinate. It taste delicious . I know it’s not ideal, but have you ever tried grilling these on a stove-top grill pan?